When you're doing all you can as estate agent, and when you can't do any more on your own, it's time to get help. It might be time to expand your results and your reach with your own real estate team. In this post, you'll discover how. What is a property team? To be clear, you do not have to be in a team or build a team to be successful in real estate. There are many solo agents who just love to sell houses and work with clients. Many of them do very well for themselves. It really comes down to your own goals and aspirations. How far do you want to go as an estate agent? If you are happy finding and selling your own listings, sit in your own show houses, handle your own admin and run mostly solo, good for you. That's the sweet spot for many other estate agents also. Some estate agents, however, want to benefit from the leverage and reach that a team of agents and assistants can offer. In Keller Williams there are quite a few different types of teams. It can be as simple as a husband and a wife selling properties together. Another simple type of team may consist of an experienced estate agent with one or more assistants. A lead agent with one or more assistants, buyer and seller agents working together may be another type of team. A recent type of team introduced by Keller Williams is a team led by an attorney or other allied associates like bond originators (more about that soon). The common thread running through all types of teams is the fact that it embraces the concept of succeeding though others, one of our core beliefs. Regardless of your talent, experience and organisational skills, there is a limit to what you can achieve as a solo agent. Even though you might be able to do very well on your own, a team of people working together will obviously be able to do more. To explain the underlying power of a team, let me ask you, if you don't employ a gardener, who has to mow the lawn? You mow the lawn! If you don't take your car to a car wash and you don't have someone to wash it, who has to wash your car? You have to! Maybe you enjoy mowing your lawn and washing your car, but it's still your time that could have been spent doing other things. Also, someone else might actually be a better and quicker mower of lawns or washer of cars than you. Whether you are a rookie agent or an experienced campaigner, there are numerous benefits attached to teams. Getting started in the property game is a tough proposition. You only make money when you sell houses, and it can take months before you sell your first house. The rookie faces the prospect of not earning enough money for an unknown period because it takes time to become established. You must build up a database, learn to generate leads, and gain experience and confidence. The rookie agent must do this and much more while completing the practical and education requirements to operate as a full status agent. Your real estate qualification exposes you to the laws and regulations regarding the process of selling houses. Unfortunately it doesn't follow that you then immediately also know how to sell houses. For many, that's a tough ask. However, learning from a mentor who has been successful in your market is the best way to learn how to sell houses and build your business. It will drastically reduce your learning curve when starting out as an agent and save you money. A rookie agent who joins an established team will get access to the experience, structure and business opportunities offered by the lead and other agents and staff on that team. Lead agents will provide training, pay office bills, and offer other perks to get agents on their team. In short, a new agent who joins a team will probably get going faster, learn more and earn more than the average newbie. How far do you want to grow? If a team operates at a high level, it will help an established agent sell more houses by providing support staff, leads, accountability and help. You can benefit from the diverse skills sets, personality types and focus that a team of specialists with clearly defined roles and responsibilities brings. This allows you to focus on the areas that you excel at while building a business that expands far beyond your own capabilities. Your customers will also benefit because of the better service that a team of motivated, well-trained people can provide. If an agent or staff member goes on holiday, somebody else will be able to pick up the slack. A well-established team will always outperform an excellent solo agent. If you're the lead agent, you will also be able to build your team as a business. Eventually, if this is what you want, you will even be able to extract yourself from the day-to-day operations of the business, which frees you up to do other things. You move from an agent to becoming a business owner. That's a business worth owning. Teams provide leverage. Leverage allows you to exponentially increase your business results. Our mission is to help you build a career worth having, a business worth owning and a life worth living. To grow your business to a place where this is possible, you need a team. So how does it typically work? The first thing to remember is that there is no typical team. 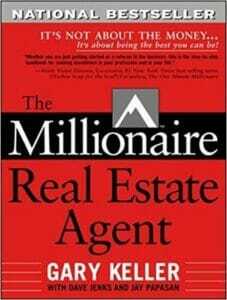 In the Millionaire Real Estate Agent, Gary Keller looks at a number of the most successful real estate teams. That lead to the Organisational Model. Let's discuss the various types of teams mentioned above. It often happens that, say, the wife joins Keller William as an associate while her husband still has another job. He might be helping her out by putting up boards for her and at show houses. When the wife starts generating a good income, the husband then decides to quit his job and also joins Keller Williams. As mentioned before, husband and wife teams often do very well in Keller Williams. Not only do they have different skills sets that complement each other, they also know each other very well. They generally share dreams, hopes and ambitions, which drive them to do better together. There may be many different remuneration models for husband and wife teams, but at Keller Williams Eden they will generally only pay a cap and a half to the Market Centre. As your property business starts flying, you will find that your time is gobbled up by many administrative and other duties that, although important, don't directly lead to your income. If you hire talent – and you have to hire talent – you will be able to focus on those activities that will increase your bottom line. At Keller Williams we believe it is so important to hire someone who is the right fit for the job that we present a full course, Career Visioning, on the topic to our associates and staff. Keller Williams agents and their assistants have front row access to industry-leading training, coaching and accountability programs. Tap into the Keller Williams training resources to train your assistant so she can truly provide the leverage your growing business needs. Ideally, your first assistant will become your executive assistant. This is someone who can run your business, systematise your business and help you grow your team. As your business grows with the assistance of this person, she will develop into becoming an assistant executive in your business. As an experienced agent, in time, you might begin to prefer to work with, say, sellers. After all, listings are the lifeblood of a healthy property business. You might notice that your natural abilities align that much better with the duties of a listing agent. Maybe you just don't enjoy driving buyers around anymore. Maybe showing homes is not as enjoyable to you as marketing homes and negotiating for sellers. The point is, you'll develop your own niche. You will still be the lead agent who generates most of the leads and listings. We call such an agent the Rainmaker. However, even if you’re a rainmaker, you’re still going to have to turn away leads you don’t have time for. Learning how to build a real estate team will mean you can work every single lead that comes across your desk, and generate more referrals from closing them. Obviously you cannot be in 10 places at the same time without the support of a team. Your team will be able to hold 4 or 5 show houses at the same time. This will also create many buyer leads for your team, which have to be converted. A buyer agent’s top priority is to make sure no lead slips through the cracks. As Team Leader, you must provide them with a rock-solid lead cultivation and conversion strategy. You must also be ready to hold them accountable for database maintenance and follow-ups. One of the last hires you will make is that of the listing assistant or agent. A listing agent will grow your business to unbelievable heights, if you hire the right person. This is someone who is driven and sociable. The main functions of a listing assistant is to set up listing appointments and get signed mandates. The listing assistant will make sure listings get loaded onto your listing management system, gather all required documentation such as the signed mandate and FICA documents and advertise the listing on social media. In this post, we have given you a brief glimpse of the growth and leverage possibilities available to you at Keller Williams. Remember, you only have to grow yourself to the point where you feel comfortable. You don't have to go beyond the limits of your own goals or comfort. If you want to start your property team in Keller Williams Eden in the Garden Route, you only need to get three key hires right. They are your first assistant (executive assistant), your showing assistant (who can become your buyer agent), and your listing assistant or agent. If a real estate team seems to be the next step for you, or if you require more information, click here to arrange a confidential discussion with us.